I have been posting an awful lot of personal work this year and it has been getting some good reactions and so I thought that I’d round 2014 off with this picture that I took on the way to an excellent photographers get-together last night. ©Neil Turner, December 2014. 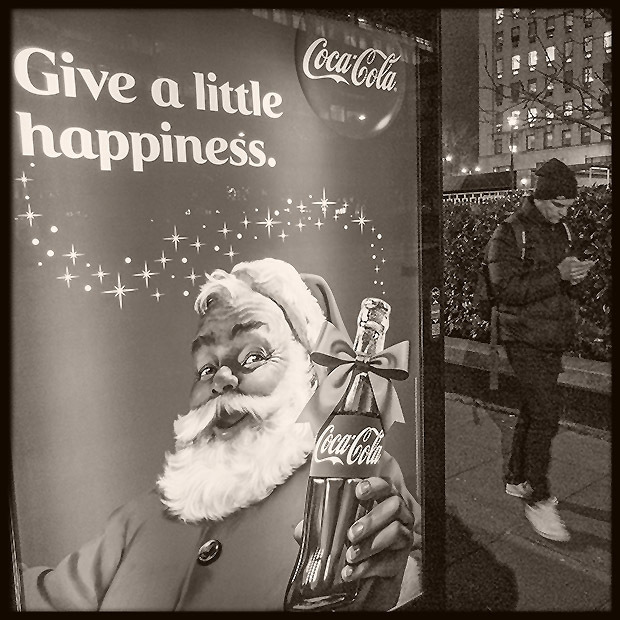 Pedestrian busily using his movie phone walks past a bus shelter Coca-Cola advertisement offering some seasons branding. Seeing colleagues, many of whom were in very un-cool knitwear, having a meal and chatting about life and work is always a pleasure and I’m just here in my office wrapping up a few loose ends of work before taking some time to be with family and friends. Another year has been (during which I had my 50th birthday) and almost gone and it is rapidly becoming traditional for photographers to post a gallery of their best work from the year. I have never been a fan of the practice – partly because some of my best work is corporate and the clients would rather I didn’t splash it over my blog, partly because a lot of it is shot in schools and there remains a sensitivity about pictures of children and the web and partly because by the time I get around to thinking about doing gallery it looks a bit like a “me too” coming a week or more after those of my friends and colleagues. This blog has had a good year with lots of visitors a whole bunch of new postings and some very interesting interactions with people who took the time to get in touch. The blog has the tag line “me writing about photography because I want to” and that remains very much the case. I wish those of you who celebrate Christmas a very happy time and for anyone reading this who don’t – I wish you peace and love and everything that we all want anyway. Techie stuff: The picture above was shot on a Fujifilm X20 at 1/50th of second, f2 on 640 ISO. The B&W conversion was done using Tonality.